Ford promised to return the mid-size Ranger on the roads in the US and spy shots are proof that Blue Oval Brand is working on this version. The new version of this model will go on sale as the 2019 Ford Ranger. The production will take place at the Michigan Assembly Plant. Ford returns this model after the absence since 2012. Back then, mid-size models weren’t so popular and Ford also wanted to favorite the sales of the full-size F-150. However, since arrivals of the redesigned Chevy Colorado and GMC Canyon in 2015, the sales of the mid-sizers exploded and Honda also launched the all-new Ridgeline. Ford knows that it is time to return to the game and the new US Ranger will join brand’s lineup of trucks probably in late 2018. Fans should also expect several versions of this model including the high-performance Raptor model. Ford hasn’t revealed any specific detail about the upcoming 2019 Ford Ranger. However, Ford said that this model will also get the SUV counterpart based on the same platform which will revive an iconic Bronco nameplate. However, it seems almost obvious from the spy photos that US Ranger will be heavily based on the global Ranger model which hasn’t been discontinued. The platform with the code name T6 that underpins the global Ranger and Everest SUV will also be the base of the US Ranger and new Bronco version. 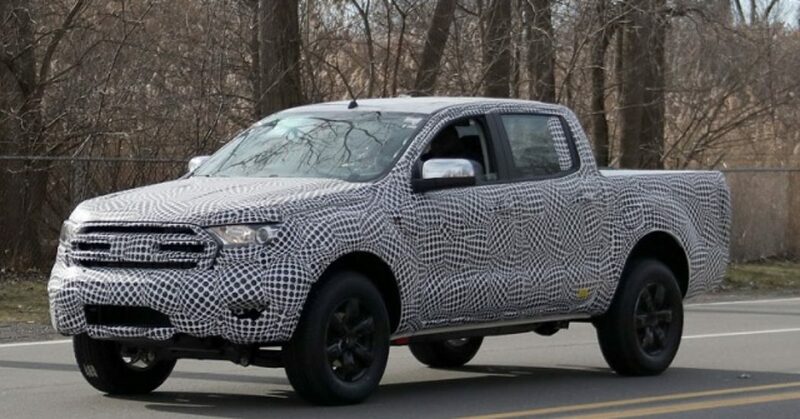 Judging by the camouflaged prototypes, the new Ranger will also be in similar proportions and overall styling won’t stray far from the global version. The US prototype seems to have slightly smaller and different grille version then global model. There will also be other differences but they will be in details. According to the 2019trucks.com, Ford will also launch the Raptor version which should arrive later. This version will get beefier bumpers, unique grille, off-road tires, taller ground clearance plus it could be wider and ride on a longer wheelbase. Ford will likely offer the FX4 off-road package with the new Ranger. When it comes to the interior, the US version according to recent spy photos should also borrow most of the design from the global version. The dash design including the center display and buttons layout should look very similar to the global design. The equipment, on the other hand, will be according to US demands and upgraded to the newest standards. The Ranger will also include the latest active driver assistance systems. With other details about the 2019 Ford Ranger, Ford also successfully hides details about the engine options. The global Ranger comes with the 2.2-liter inline-4 and stronger 3.2-liter inline-5 diesel mills. The US version will likely offer the diesel option possibly the versions from the F-150. The gasoline options could be available in the naturally aspirated form for the entry-level model. We will also see a 2.3-liter EcoBoost inline-4 or 2.7-liter EcoBoost V-6. The 3.5-liter twin-turbo V-6 in the re-tuned version could power the Raptor version. What is sure, on the other hand, Ford will offer the new Ranger with the new 10-speed automatic transmission. The 2019 Ford Ranger is expected to make the premiere at the 2018 Detroit Show. The production will begin later in the year. The model should be available for around $25k. The Raptor version could cost around $40k.